Using a special technology, Western masterpieces have been permanently glazed onto 1,000 ceramic tiles which are exhibited in underground exhibition rooms. With the roof planted in greenery, natural lighting, and outdoor viewing spaces in each area, the design feels open and inviting. Built at a cost of some US$800 million to commemorate the 75th anniversary of the founding of Otsuka Pharmaceutical group, the museum is the first of its kind to exhibit full-size exact reproductions of famous artworks from 170 museums by baking photographic images onto huge ceramic sheets. The Otsuka Pharmaceutical Group decided to do this as the originals can be easily damaged by environmental conditions, earthquakes or fire, and they saw this as the ceramic reproductions of an effective means of preserving the cultural heritage. 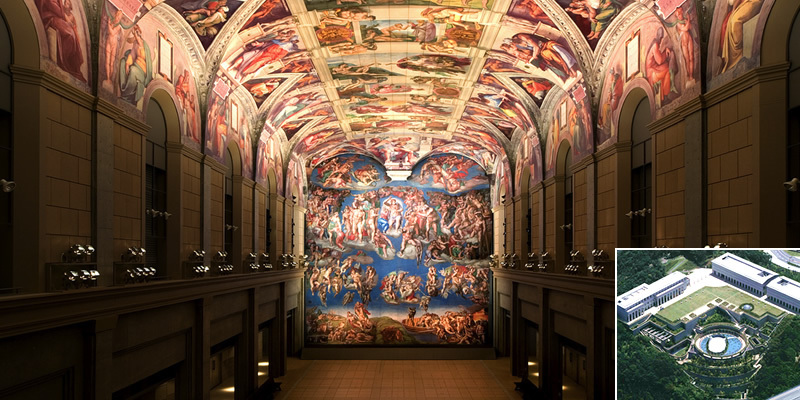 The high point of the "collection" is a full-scale recreation of the Sistine Chapel. The gallery also includes the complete works of Leonardo da Vinci, all of Rembrandt's self-portraits, Picasso's "Guernica" and even a long-lost El Greco altarpiece whose original panels are split betweenMadrid and Bucharest. 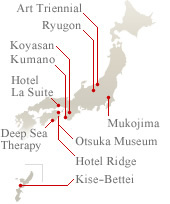 The Otsuka Museum of Art is situated in Tokushima Prefecture on the eastern tip of Shikoku Island in the Seto Naika Inland sea national park overlooking the Naruto straits. Tokushima Airport is a 1hr 15 mins flight from Tokyo.